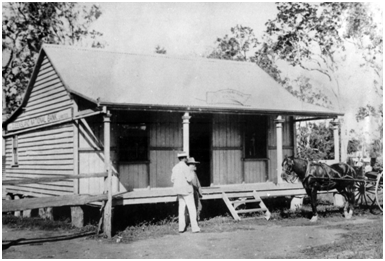 The North Pine Branch of the Queensland National Bank opened on 27 August 1887 in premises rented for 15/- a week from Alexander Jackson Wyllie. Although the precise location of the building has not been documented in any records, it appears that it was sited in O’Loan Lane, a 19th century laneway which ran off what is now known as River Street in a south-easterly direction parallel to, and close to, the Cooke Street of today. Grant (Phillip William Grant) Pinnock, who had been employed by the bank since 1881, was appointed Manager. Pinnock, who was born in the New England district of New South Wales in 1859, the only son of Philip Pinnock, a well-known squatter and later police magistrate in Queensland, married Minnie (Mary Helen) Petrie, Tom Petrie’s eldest daughter, in 1884. His salary in 1887 was £180 per annum plus an allowance of £90 per annum. The Pinnock family initially lived in the premises, a partition having been erected to create a bedroom. A series of entries in Wyllie’s diary reveal that the pioneer settler and carpenter, Nikolaus Ebert, was engaged by Wyllie from 29 October to 11 November 1889 to refurbish a pre-existing building for the bank’s use; a further entry the following day states that Wyllie was “occupied shifting the Bank into the new place”, clearly indicating a change of premises on that date. By 1891 the business had expanded sufficiently to require the services of an accountant. A rent allowance of £39 per annum was provided to allow the Pinnocks to reside elsewhere and the accountant was then accommodated in the bank building. By this time, the manager’s salary had been increased to £265 with an allowance of £132/10/-, in addition to the rent allowance. The bank’s long-term intention was to erect its own premises closer to the North Pine Railway Station. Although a vacant allotment had been purchased from Tom Petrie in 1891, a building was never constructed on this land. Due to the severe economic depression of the early 1890s, the branch closed on 30 June 1893. As only nine current accounts were still operating, the remaining business was transferred to Sandgate. Queensland National Bank, North Pine. During the period of his residence in North Pine, on 12 January 1892, Acting/Captain Pinnock had been posted as Officer Commanding the newly redesignated Number 4 Company, North Pine Mounted Infantry, a group raised from volunteers in the Pine Rivers area. He was later to serve with great distinction in the Boer War and he subsequently pursued a full-time career as an Army Officer. Over half a century was to pass before a bank (other than mere agencies) reopened in Petrie. The National Bank funded the construction of a faithful replica of the original building in Old Petrie Town, using photographs and details provided by the bank’s archives. This building was opened in 1987, marking the passage of a century since the original branch had opened in North Pine. 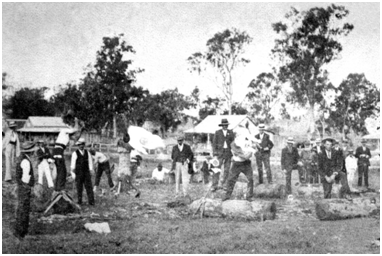 Outdoor events, such as wood chopping, were held on Alexander Jackson Wyllie’s land during the 1890s. The Queensland National Bank is believed to be the building in the background near the centre of the photograph. Alexander Jackson Wyllie, Diary, unpublished manuscript held in the Local History Collection, Moreton Bay Region Libraries, 5 March 1888 – 8 February 1892.